The GOES-13 satellite saw Hurricane Irene on August 27, 2011 at 10:10 a.m. EDT after it made landfall at 8 a.m. in Cape Lookout, North Carolina. Irene's outer bands had already extended into New England. Some NASA space and research centers along the U.S. East Coast are mopping up in the wake of a weekend pounding by Hurricane Irene. 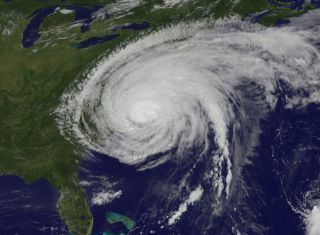 Four NASA centers in two eastern states and Washington, D.C. were on alert for Irene's arrival heading into the weekend. The storm made landfall in North Carolina as a Category 1 hurricane, then weakened to a tropical storm as it made its way north along the coast. So far, the storm is responsible for 35 deaths in 10 states, as well as widespread flooding, according to press reports. NASA's Washington headquarters was open for business today, with employees able to take leave as required to attend to any Irene-related issues, officials said. Other centers experienced some flooding or damage from the powerful storm. On Friday, a ride-out crew at Wallops was anticipating a storm surge of up 2 feet (0.6 meters) at the facility. "At WFF power and communications have been restored," Campion told SPACE.com in an email. "Areas of the south end of the island will be restricted until the buildings get cleaned out and some roads are cleared." Campion said repair crews are fixing a roof leak in one of the buildings at the Goddard center, which also oversees the Hubble Space Telescope program and other science missions. An off-site facility used to manage the Joint Polar Satellite System, a weather satellite program NASA runs jointly with the U.S. National Oceanic and Atmospheric Administration, is still without power, he added. But in general, both the Wallops and Goddard centers weathered Irene well, officials said. "Employees at both sites have [the] option of taking unscheduled leave if they have home/family issues that need to be addressed," Campion said. Another NASA center, the Langley Research Center in Langley, Va., also instituted a "liberal leave" policy for employees affected by Irene. In a status update posted on Twitter, Langley officials said there was minimal damage and debris at the center. "Wishing all #Irene sufferers smooth clean up and quick power restoration! Many of our workers feel your pain," Langley officials wrote in a Twitter post.